Vision is a publishing house who created the original guide books for the greatest ancient cities with Past & Present images of the most important monuments and archaeological sites. Since 1959,Vision has been applying a patented system which consists of printing, on transparent material, the image of the reconstruction of an ancient monument or of an archaeological area, in such a way as to overlay this reconstruction on a photograph of the same subject in its present state. This system is the only one which can give a simple and clear vision of a monument as it was before its destruction and as it is now, since it allows for an immediate and direct comparison between Past and Present. 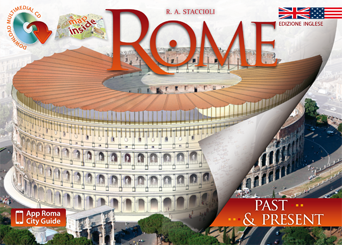 The guidebooks of the Past & Present series concern the most important archaeological sites in Italy: Rome, Hadrian’s Villa, Ostia, Pompeii, Herculaneum, Paestum, Roman Catacombs and Vatican Necropolis, Agrigento, Selinus, Segesta, Taormina, Piazza Armerina; in Greece: Athens, Olympia, Delphi, Crete; in Israel: Jerusalem, Massada, Tiberias, Megiddo, Caesarea, Capernaum; in Jordan: Petra, Jerash and Amman; in Lebanon. Vision publications are translated in 15 languages and are also very successful outside of Italy: they are distributed throughout Europe and USA where they are sold in the most important museums such as the Musée du Louvre and the Musée Maillol in Paris, the British Museum in London, the National Gallery in Washington D.C., theEgyptian Museum of Turin, the National Archaeological Museum in Athens, the Paul Getty Museum in Malibu, the Cleveland Museum of Art in Cleveland. During its years of activity Vision has also made co-editions with international publishers as Schnell, Arena Verlag and Steiner and Oncken (Germany), Frommer’s-Macmillan, IDG Books e Paul Getty Editions (USA), and supplied its reconstructins in publications edited by Alitalia, the British Encyclopedia, the Swedish Bonniers Lexicon, the Norwegian Aschehougs Konversajons Leksikon and to Mondadori for its weekly magazine “Epoca”. In 2008 the Vision Kids comic book series was created, dedicated to children and young adults, that includes for the time being, Ancient Rome comic strip. A Past and Present trip comic strip with Cicero the cat, Pompeii, a Past and Present trip comic strip and Time Travellers. Hidden Rome. Original and amusing books on the history of the monuments that have made Rome and Pompeii famous as well as on the most curious aspects of the ancient Romans’ daily life: all with the entertainment of a comic strip and with see-through reconstructions on acetate that complete the monuments; a fascinating trip into the past but with a new view of our present way of life.